For the past eighteen months, The Elephant Village in Baan Ta Klang, Surin, Thailand has been blessed by Callie Jackson teaching English to the children of the village. Callie comes from a small town in Northern Ontario. She has a degree in journalism and a passion for elephants. Fortunately, she made a connection with Kru Oh, our Thai spiritual leader for English education, and found her way to our village. Sadly, it is now time for Callie to return home and we asked her to share a few of her experiences and favorite images over her tenure. However, to provide some further background for the past six years or so, we must first talk about Kru Oh and the village which is very remote and home to the elephant culture of Thailand. There are some three hundred domesticated elephants in a village of less than a thousand Kuy people. The Kuy people are a separate ethnic group on the Thai/Cambodian border, principally speak their own unwritten language and have been elephant people their entire history. Accordingly, the strategy of The Golden Triangle Asian Elephant Foundation and The Elephant Story is to provide English education to offer the youngsters a future so as to improve the livelihoods of their families and the sustainability of their elephants. In the beginning of our educational interests for the village, the force of Khun Pacharee Jaengvong, or Kru Oh as she is known to us, appeared. She is the leader of Learning Link, based in Ayutthaya, Thailand, the historic capital of Thailand. Some of you may know that in many Asian cultures, teacher is the description of a recognized and revered person who provides others a different window into life. Buddha and Jesus provided that enlightenment thousands of years ago. In Thailand the revered title is “Kru.” The honorific name of “Kru” is never given to people in politics, the military or business. It is something that is earned and only the most deserved are addressed with that simple description. Look at the engagement of Kru Oh with the children below. Her presence and passion are magical. The villagers know that and have complete confidence and trust in her. About two years ago, Callie Jackson connected with Kru Oh and signed on to teach English in the village. There is something to be said for someone coming from a small village in Ontario to go settle in a much smaller village in Thailand. In actual fact, that might be the magic formula as Kru Oh said, “Callie integrated with the community, spending time in their homes with their families.” Kru Oh and Callie are shown below in a classroom. Callie is shown here with some of the students. We should not be surprised that the girls represent the best learners though the young boys are moving forward and may even up the odds in the future. Apart from the children and their families, Callie also spent time with the elephants to round out her experience. Swimming with elephants has to be in a different dimension from cleaning out horse stalls back home. Lastly, we would like to thank Kru Oh for her inspiration and Callie for her dedication to our cause. There is another Kru title out there in the future of a young, inspired Canadian lady. We close with another image of these two folks in a village home with two of their students. Thank you, ladies! We are all indebted to you for making Baan Ta Klang a better place for the Kuy people and ultimately their elephants. 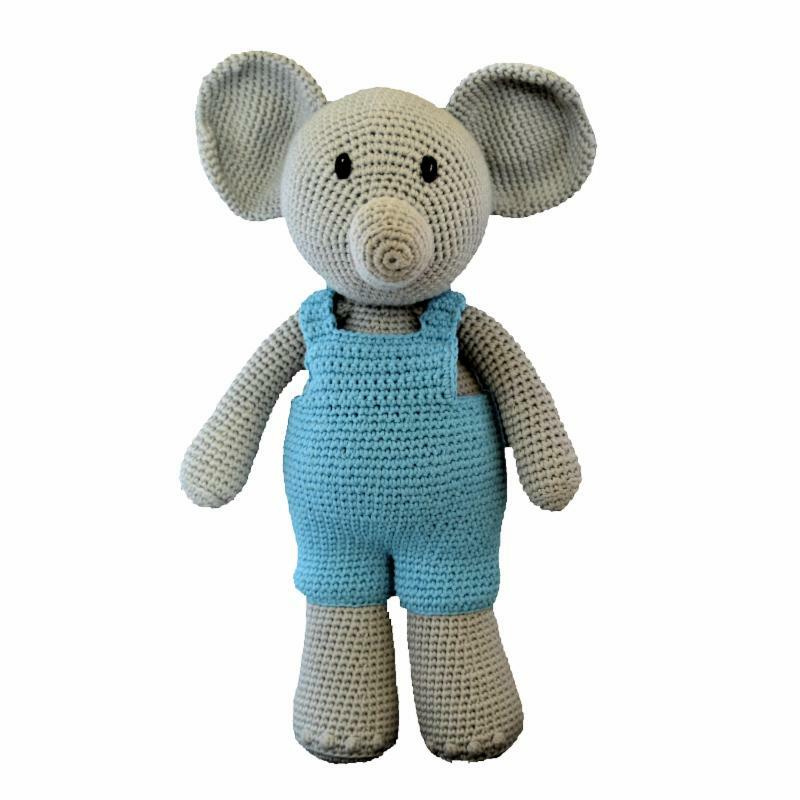 Our charming elephant plush toys are hand-crocheted in Vietnam. 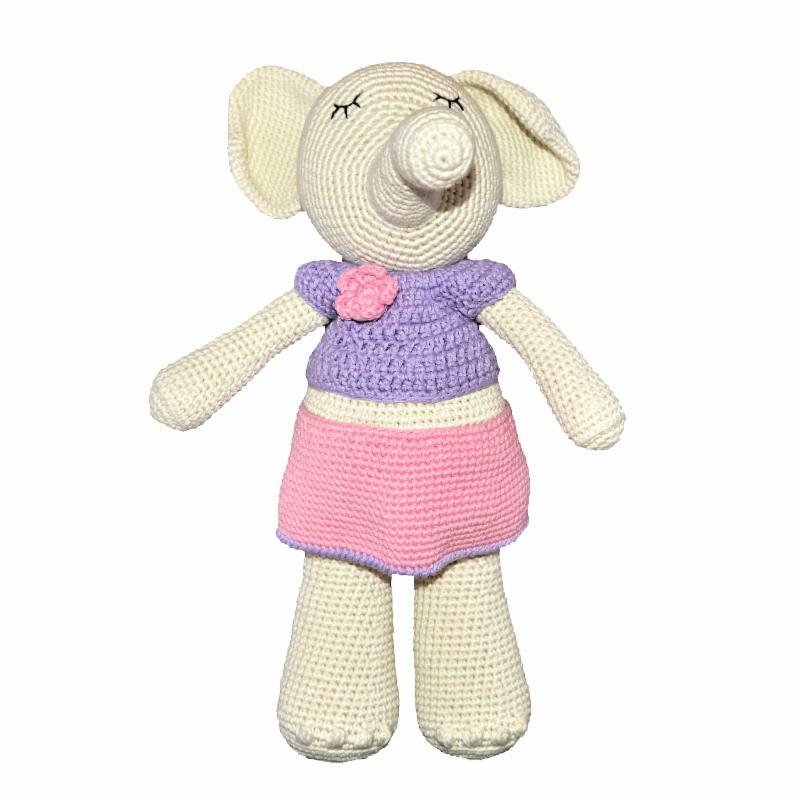 They are soft and cuddly and your little ones will love to hug them close and we are sure they will become a cherished favorite. These whimsical toys stand 16 inches high and are ready to entertain your little ones!